My undergraduate theology degree is indisputably from a Catholic perspective, although many of the scholars we studied were not Catholic, nor even Christian. I was required to take only 4 semesters of biblical literature, but even those few academic hours of biblical studies taught me enough about biblical analysis to understand how “The Bible” (which, as I’m sure you know, is just a mutually-agreed upon canon of literature which omits as much as it includes) came to be. I often think that it is a shame that true knowledge about biblical literature mostly seems to reside only in academia. Unfortunately, most of the zealots out there would and probably do regard biblical scholarship as an attack on God. The battles over the centuries over biblical inerrancy/infallibility/literalism are merely unread footnotes to most people. Significantly, though, something happened back in the 1970s or 80s that has swung very conservative Christians (at least) into this reactionary stance. There was a discussion that if the accuracy of the bible were called into question, Christianity would be so adversely affected that it would collapse. So, conservative Christians made that stance their banner. Unfortunately, I believe, this position actually creates a greater level of cognitive dissonance, and can only do just that, as human intellect evolves and electronic media spreads information (and misinformation) widely. Back in biblical times, they had their own version of media and sharing of knowledge. It was called kerygma — specifically meaning the proclamation of the Good News. The earliest disciples proclaimed the Good News by telling stories of their experiences with Jesus. These stories were told and re-told, the way we post and re-post things on Facebook and Twitter, et al. Digital media isn’t even perfect in that regard, so how should we interpret the “whisper down the lane” telling of the stories of Jesus? Even Jesus used stories in his kerygma — today we call them parables. They are stories meant to convey a message, whether it is that we should rejoice because of the life of Jesus, or that we need to consider “What would Jesus Do?” in trying to live our lives for others, etc. Then there are the issues of multiple sources for the written biblical literature, varying levels of completeness of the sources, different versions of the same stories in the different sources, and THEN we have the translations! I personally own a number of Bibles, from which I can read the same story written with different words. Preachers and homilists focus on different items in the scriptures of the day in church. Sometimes, their focus seems to miss points that I (humbly) think are more important. Oh, well. The Noah story is interesting, because if you focus on the details building up to the Big Event, God really does seem like a mass murderer, because, REALLY? — all of those children were corrupt, and every single one of those adults was corrupt? (But of course, one could say that about God “letting” horrible things happen to innocents throughout time, e.g., famine, war, disease, death.) (And one can’t ignore the fact that an epic flood disaster features prominently in a number of ancient cultures. So-o-o… what does THAT mean?) 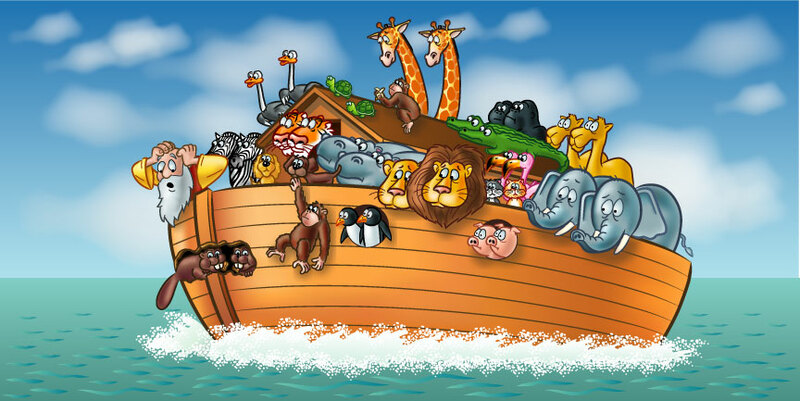 I’m trying to come up with a non-evangelical explanation for a decent purpose for the Noah story, but I can’t. It’s all about God establishing a covenant relationship with “His” people, that he would be there for them if they lived righteously. So there. Of course, they didn’t (The Golden Calf springs to mind), resulting in various tragedies for the Israelites, various later redemptions by God, etc. etc. Jack, I am humbled by your proclaiming my comment as “Comment of the Day” and me as a theologian, but I’m not quite in that exalted (and scary — see The Congregation for the Doctrine of the Faith, formerly known as the Supreme Sacred Congregation of the Roman and Universal INQUISITION, vis a vis Hans Küng, Charlie Curran, Pierre Teilhard de Chardin, Edward Schillebeeckx, Leonardo Boff, et al.) realm. Just my humble opinion based on my beloved undergraduate studies in theology. But then, in a way, we are ALL theologians, aren’t we? Even atheists. Well, I said you were the resident theologian, which is a little less exacting: you’re the closest thing EA has to one, that’s for sure, at least of whose made have made themselves known. But then, in a way, we are ALL theologians, aren’t we? Even atheists. How can one deny the existence of even Santa Claus or the Easter Bunny without studying the subject? Let alone a topic that has occupied some of the finest minds throughout the ages. My partner has a High Distinction in Theology from the Australian Catholic University. I audited the course with her. It’s not the existence or otherwise of Unicorns and Fairies that’s important, it’s how we should treat one another, and even how to investigate the ineffable and unknowable. Wouldn’t that be enough of a reason evangelical or not? I’m not an evangelical, but I always thought they teach that God has a covenant relationship with Israel. I guess what I meant was that I couldn’t find a justification for all of that death and destruction. You’re right, of course, about the covenant, but you have to be a believer to accept that. True. I think the death and destruction might be a genuine stumbling block for some but I see it mostly used like Bill Mahr used it as a way to say God is a bully. I think one way to think of it is that death has a different meaning for God than for man. He might not think of it as punishment at all. To Him death is a step in human progress not the end. For Him those deaths might be a way to keep people from continuing in ways that are harmful both to them and to mankind in general. In that sense death is merciful and has a specific beneficial purpose. Excellent! Delighted to see this level of commentary on this subject here in Ethics Alarms, kudos to you and to Jack. Just Patrice. She is always a breath of wisdom and sensitivity leavened by scholarship, and I wish I could entice her to comment more often. What he said. Wisdom. Sensitivity. Scholarship. I’d add Kindness too.